Researchers at Brescia and Western found public education through branding is increasing sales of healthier food in dining halls. 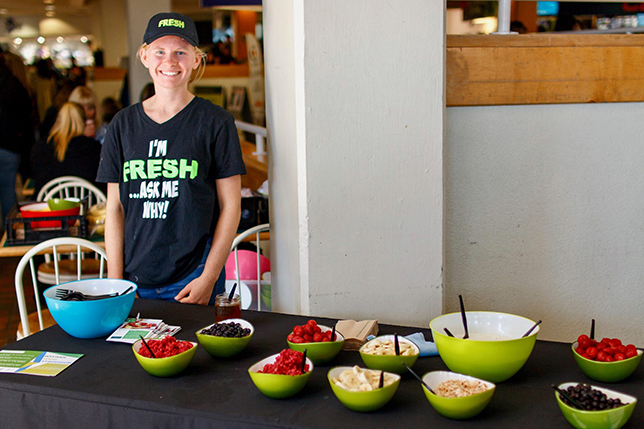 Branding that highlights nutritious food items leads students to make healthier food purchases in campus dining halls. That’s the conclusion of a new study by researchers at Brescia and Western universities. The researchers looked at the impact of the Food Resources and Education for Student Health (FRESH) Approved project. The peer education campaign started in 2010 as an information fair and food demonstrations by master’s students in Brescia’s school of food and nutritional sciences, and has grown into an ongoing partnership between the academic unit and Western’s hospitality services. As part of the joint effort to get students eating well, they developed a FRESH Approved logo and labels to identify menu items determined by a registered nutritionist to be high in nutritional value. Using a model adapted from Eat Smart, a nutrition program for workplace cafeterias, the FRESH Approved rubric evaluates food items based on factors like sodium, fibre, fat and sugar content. FRESH approved items include all fruits and vegetables, most salads, most grain dishes, some pasta meals, most vegetarian dishes, some meals that contain meat and fish, and dairy items such as milk. Using hospitality services’ data on residence dining hall purchases from 2011, when the labels came into use, to 2015, the researchers found that FRESH Approved items sold “significantly more than non-FRESH items,” says primary investigator Jamie Seabrook. He also noted that the price of FRESH Approved items was significantly lower than other food items. The results put the lie to a commonly held belief that “eating well is more expensive,” says Dr. Seabrook, a sociologist cross-appointed at Brescia and Western. The average mean price per serving for FRESH Approved items ranged from $1.37 to $1.52, while other food items, such as fries or dips, averaged $2.05 to $2.21 per serving. The study reinforced previous research that shows food labelling influences shopping habits, “it just hadn’t been done in a residence dining hall before,” the researcher says. Undergraduate students gain an average of 3.2 kilograms (or 7 pounds) in their first year at university, Dr. Seabrook says. In a survey of Western students conducted before the 2012 roll-out of the FRESH Approved labels, 59 percent of respondents said that finding healthy food options on campus was a challenge. This latest research now shows that food-labelling initiatives has an important role to play in encouraging healthier consumption habits at campus dining halls.